This month's ARTafterDARK will be happening on Fri. Jan. 29th at the Honolulu Museum of Art from 6 to 9pm. This month's theme will be Kawaii Hawai'i. I will be spinning Japanese music throughout the event. KTUH alumni DJ Jem will be spinning as well. Information on other performers and more can be found at ARTafterDARK's page. 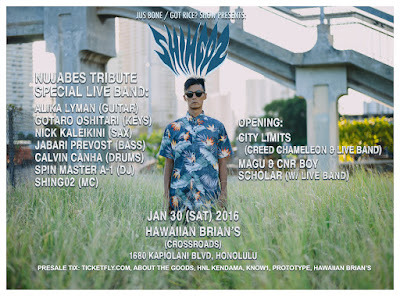 The Nujabes Live Tribute Show will be happening on Sat. Jan 30th at Hawaiian Brian's starting 9pm. Shing02 and Spinmaster A1 will be performing with a live band of various musicians. KTUH's DJ Bone will be hosting the event. Check out the event's page for more information.